Google sets certain quotas related to compute resources when the Project is created. Quotas are limits assigned to the Project based on the zone where the Project/ Deployment is launched and the user account history with Google. In some cases, mostly when the account is new, these quotas are low and they don't permit to provision a deployment with higher resources. You can find additional details to each quota type below. To get access to more compute resources and have an option to increase quotas, your account needs to be upgraded first. When logged in your Google Cloud account, click on the UPGRADE button in the top right corner to upgrade your account. If you don't see such button in the IP quota tab, it means that you account was already upgraded. You can continue to step 2 below. Check the individual quotas before adding a new server to the deployment or before provisioning a new deployment. Login to https://console.cloud.google.com and select IAM & ADMIN from the main menu in the top left. Make sure the correct project is selected since quotas are assigned per project. On the top left of the console, it shows you which project you are managing. Then click on Quotas. Under Quota type filter, select “All quotas”. 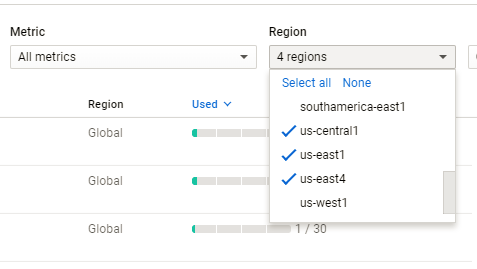 On the right under Region, you can select the zone where you have your deployment or plan to provision deployments in the future and filter out the rest. In Metrics section, look for Static IP quotas. Search for a low quota limits as for example 0/2, 3/3, 4/5, etc. Check if there is enough static IPs to cover the number of servers you want to deploy or add. If you see these quotas are lower than you'll need, you’ll have to request an increase from Google. Mark the checkbox next to the quota and click + EDIT QUOTA in the top. Request the number to be increased according to your needs, provide business justification and hit Submit request. Note: VPN also counts as an additional static IP. Preferably request few more IPs than you need right now just to have enough space for future growth and any additional settings such as VPN. Make sure to do the same for all the zones you'll need, you can select several at once. Processing the request takes from few minutes up to 3 business days. Once approved by Google, you will get an email notification and you can resume your deployment/ changes in itopia. IMPORTANT: During the provisioning process, make sure you select the same project you created initially and increased the quotas for, don't create a new one. In Metrics section, look for CPU quotas. Search for a low quota limits as for example 10, 15, 25, etc. Check if there is enough CPU's to cover the number of CPU's you want to deploy or add. If you see these quotas are lower than what you'll need, you’ll have to request an increase from Google. Check if there is enough GPU's to cover the number of servers you want to deploy or add. Once google has approved the increase, you'll receive an email letting you know.